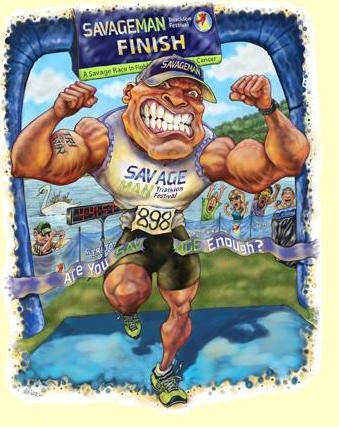 The 2014 SavageMan Triathlon Festival will be produced by Setup Events and will be held this weekend, September 13-14, 2014. The 2014 SavageMan Triathlon Festival will be a member event of the Maryland Triathlon Series. Named the hardest race on Earth by Triathlete Magazine, Savageman is a diabolical, 5,800-foot ascent up the mountains of Western Maryland. It’s caused some of the world’s best cyclists to grasp for lower gears while gasping for air at a snail’s pace of 2 miles per hour. At the end of the 70.3-mile trek, there’s little money to be made—but plenty of pride to be earned—from finishing in one piece. And if you love hard workouts, we dare you to try the 15-minute muscle shredders in our 15-Minute Abs, Arms, and Chest Workout DVD. Buying or selling real estate in Garrett County or Deep Creek Lake, Maryland? Call Jay Ferguson of Railey Realty for all of your real estate needs! I take great pride in referrals, and I assure you, I will take great care of your friends, family & colleagues! A host of athletes from around the world will arrive in Garrett County this weekend, each prepared to put him or herself through a grueling test of stamina, strength, and mettle. They will jump into the fifth annual “Tri-to-Win” SavageMan Triathlon, slated for Sept. 17 and 18, and will run, swim, and bike multiple miles on one of the most difficult courses in the world. All the while, the athletes will be raising funds and awareness for the Joanna M. Nicolay Melanoma Foundation, known as “the voice for melanoma prevention, detection, care, and cure.” Each year the name of the organization is included in all the stories and publicity, and each year thousands of dollars are raised to support the organization’s mission. But who was Joanna M. Nicolay, and how did she inspire such a movement? Joanna was a loving wife and mother, a woman whose own mother died when she was only 12. She was kindhearted and funny and devout. She was dedicated and hardworking and brave. And after a very long and arduous struggle, she died of melanoma in 2003. Because of her legacy of courage and faith, her family and friends were inspired to build something in her honor. The Joanna M. Nicolay Melanoma Foundation was born a year after her death. Joanna was first diagnosed with melanoma in the mid-1970s. Her daughter, Denise Nicolay Safko, remembers that time well. Despite the illness, Joanna was a busy mother, with both Denise and son Keith, and a happy wife to Robert (Bob). Lifelong Baltimore area residents, they met as teenagers and married when she was 18. In addition to caring for her family, Joanna, a devout Catholic, had a daily habit of praying for people. The melanoma continued to grow in Joanna, and she continued to beat it back down. She endured a 12-hour operation in 1985 to stem the disease. This experience taught the Nicolay family firsthand how strenuous, frightening, and arduous the “cancer journey” can be for both the patient and loved ones. During this time, Joanna lived her life with as much enthusiasm as she could muster, and her family cherished the days with her. 11:30 AM First athlete finishes!! 1:00 PM First athlete finishes! !